A mama's life can be hectic, all consuming and yeah, can sometimes even feel thankless. So, when my girlfriend and neighbor asked me get away with her on a Girlfriend's Weekend Retreat in Boone, NC...let's just say I didn't hesitate to say "YES!". Boone is a small college town in the Appalachian mountains full of great restaurants, bars and art galleries. But our mission was not to have a getaway weekend full of action -- it was to rest, restore and rejuvenate our tired ole mama souls! There was no question where we could do all three-at the Art of Living Retreat. A sanctuary at the top of the Blue Ridge Mountains, The Art of Living provides the perfect place for mamas to take a step away from family and focus on themselves. Although they offer signature retreats like the Happiness Retreat, Meditation Retreat, Yoga Retreat and Silence Retreat, we opted to experience the less scheduled, Eat, Spa, Love Girlfriend Getaway. 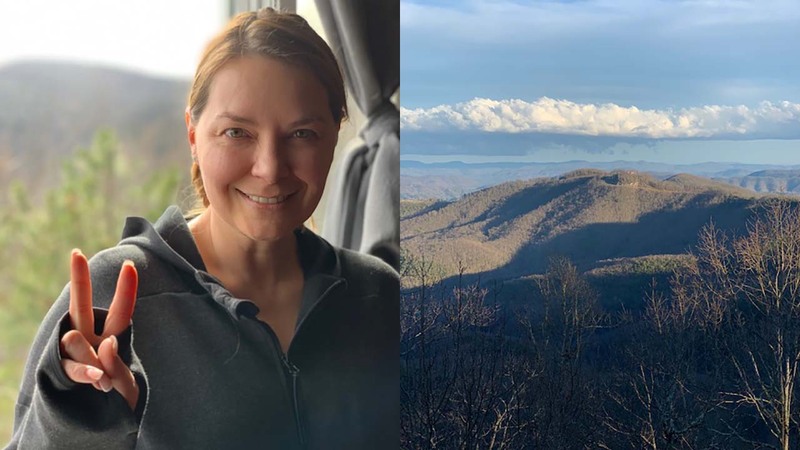 We left Raleigh on Friday morning and after a leisurely lunch at the midway point, we continued our trip to the beautiful mountains of North Carolina and arrived excited to de-stress. Although at check-in we were provided with a long list of available activities, I was hesitant to plan much ahead of time since my days at home seem to normally involve over-scheduling. I took the list to our hotel-like room and tentatively marked some "musts" and circled lots of "maybes". We were happy to enjoy girlfriend time for an entire weekend, but we also wanted to make sure that each of us was able to experience our own version of rest and relaxation. For my girlfriend, it included lots of yoga, and for me, meditation. We planned to leave lots of time for both. On Friday night we attended an art therapy class together and were asked serious questions as prompts...ie, "When did you become YOU?" It took a long time to figure out how to answer this one...Was it when I graduated from college and got my first job? Was it when I booked my first professional acting gig? Was it when I had children? Was it when I made my first big life mistake? The exercise started causing stress instead of relieving it. I decided then that I would not only focus on rest and rejuvenation, I'd also try to answer that question for myself by the end of the weekend. We awoke early and surprisingly, already a bit more refreshed. The power of fresh mountain air maybe? We enjoyed a leisurely vegetarian breakfast and chatted for a couple of hours while enjoying the stunning mountain view from the dining room. Meals throughout the weekend were plentiful, Indian Influenced and always vegetarian. In the late morning and early afternoon in between reading and enjoying the views, I enjoyed two meditation classes, a hike on the Rhododendron trail and a luxurious treatment at the Shankara Ayurveda Spa. At the spa, I chose the Abhyanga Detoxifying Warm Oil Massage -- a delicious experience that had the provider slathering me with warm oil and massaging with long strokes. Fifteen minutes in the steam room and a long stay in the spa lounge sipping tea afterwards and I was having trouble putting together sentences. In between all of the classes and activities, my friend and I chatted about life, had lots of laughs, napped and enjoyed the magical energy of the beautiful mountains of NC. In the evening on Saturday, we attended a first for me: a chanting session! Armed with a blanket, we all joined in Indian chants along with the leader who rhythmically beat on a drum and a very talented singer leading our responses. It was such a hippie dippie moment and I loved every minute of it. There was something almost spiritual about singing in unison with a group of strangers. I may have to pull out the chants I learned on our next family road trip! Sunday brought life changing meditation skill building, picture taking, more laughs and a pottery class. Pottery has been on my bucket list for such a long time and I was thrilled at the chance to give it a "whirl". We had enjoyed rest, relaxation and rejuvenation all weekend but sitting behind the pottery wheel and forgetting about everything else around me as I molded clay into a recognizable item was a great lesson in truly living in the moment. There was no room for thought about the past or the future as I gently pedaled my lump of clay into a bowl. We left The Art of Living complex late on Sunday feeling changed somehow. My brain felt reset and I felt ready to tackle family life again with more energy than I'd had in a while. Perhaps it was the quality girlfriend time, the many long conversations we'd had about life, love, family, relationships, being mothers and what it all meant. Perhaps it was having had three days where we took care of no one else but ourselves. Perhaps it was the magical energy of the Blue Ridge mountains. Or maybe, it was the realization that I haven't actually become ME yet. That I'm still learning about myself as a mother, a wife, a daughter, a friend. That the roles I play continue to change as the kids grow up, as my marriage evolves and as my friendships deepen. That I am still and probably always will be, "becoming". And, that that's OK.
Tamara is an ABC11 Influencer. View more of her work on her blog here.